« Who has the Most to Gain from Burning Fossil Fuel? One possible solution is to capture and store CO2 – a byproduct of burning fossil fuels – in underground storage. The carbon capture and storage is complete mishmash of economic, technological and political factors. Geological storage of CO2 is the cheapest form of dealing with pollution from burning fossil fuels. 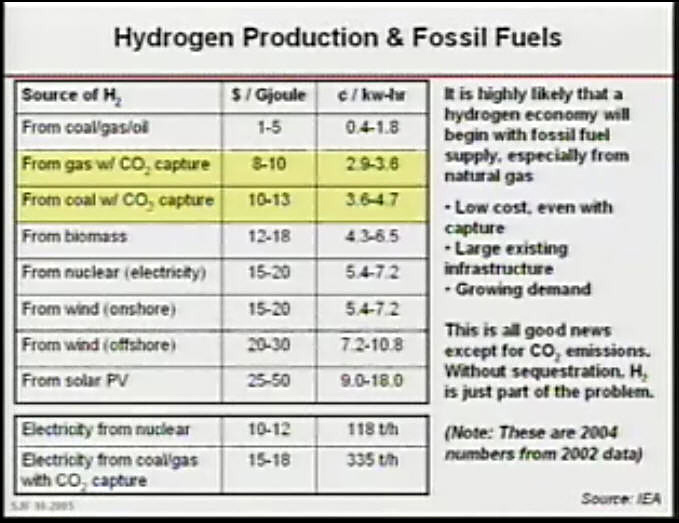 CO2 capture and storage costs about $30 per ton to store CO2 under the ground, and it can deal with 15-50% of the world’s CO2 emission problem..
Prof. Friedman showed several pictures and charts from a Norwegian oil-platform that has been using CO2 recapture and storage for 10 years. He said there is a $50/ton tax on CO2 emissions, so the Norwegian government is doing the right thing to prompt the oil company to take action to store the CO2. There is another large scale CO2 project running in Sleipner in the Norway sea, Weyburn in Canada and Algeria (by oil company BP). Forestation (planning and growing trees etc) is more expensive that geological CO2 capture/storage. 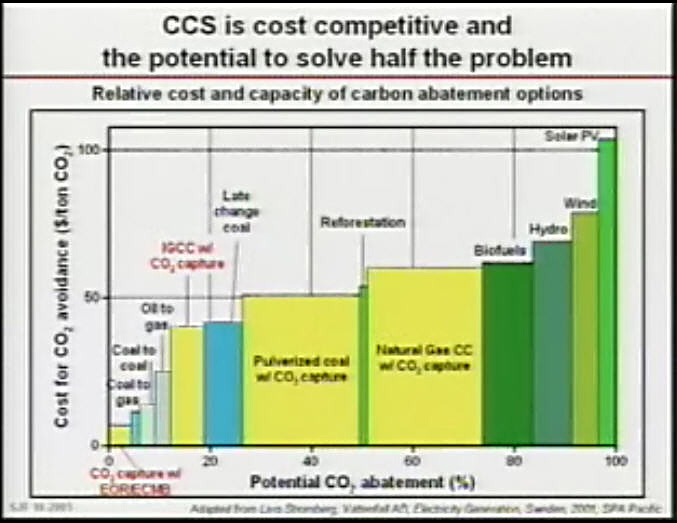 Forestation cost around $50/ton of CO2 capture and storage. China builds about 2 new coal power plants per week, and they are using 1960s technology!!!! The USA has more than 100 new coal burning plants ready to be approved and built – as of year 2007 !!!!! Hydrogen fuel is the cheapest energy alternative – even when burning fossil fuels to generate hydrogen and the use of CO2 recapture technology. Current CO2 technology does not need any new technology to be invented or proven – and it costs about US $30 per ton of CO2 for capture and storage. Some US companies are talking about several new technologies that will lower this cost even more. California has a new law that stops any power company outside of California to sell electricity to California without being certified low-emission power plants.